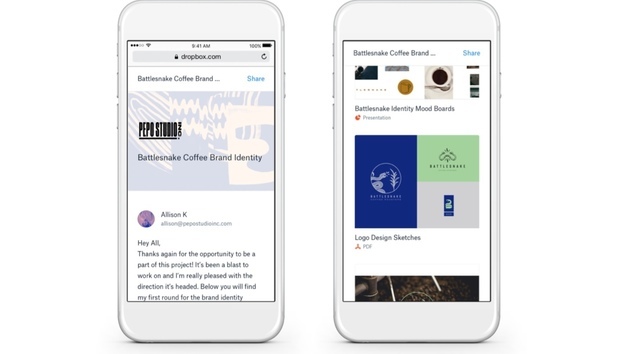 Dropbox has launched a new portfolio feature, Showcase, designed to help independent workers and small teams of professionals display and share documents more easily. The idea is that freelance workers such as architects and designers can store content in Showcase before sharing information with clients. Documents are arranged in a branded portfolio in a “secure and polished way,” with customizable layouts, said Dropbox director of product, Vishal Kapoor. It is also possible to add text captions to files to introduce content topics to help create a narrative around what’s being shared. Dropbox, which recently rebranded to appeal to “creatives,” has identified a large target audience: it is estimated that 35% of the U.S. workforce is now freelance, a group that as of 2016 totaled to 55 million people. Showcase is aimed at overcoming some of the problems users face when sharing documents. For example, a marketing consultant might want to know if their client has actually opened more than just the first of a batch of five files. With Showcase they can track who has viewed, downloaded or commented on documents within the portfolio. Files stored in Showcase are synced with Dropbox, meaning that any changes are instantly updated. While Showcase is targeted at independent workers, it is just as suited to small teams of people within large companies, said Kapoor. Showcase is launching as part of a new pricing tier: Dropbox Professional. This also includes Dropbox Smart Sync, unveiled earlier this year, which lets users view all of their Dropbox documents from a single device, whether they are stored locally on a hard drive or in the cloud. The Professional tier is available for $199 a year and includes 1TB of storage. It offers data protection and security features such as two-step authentication and remote-wipe, as well as priority chat support. McClure said that targeting self-employed workers offers a point of differentiation for Dropbox in a competitive cloud storage and file-sharing market. Showcase, which launches for Professional users today, is also available in early access to Dropbox Business Advanced and Enterprise customers.